@me_dapper is our Instagram tomboy, her style led us to her. Meeting her in person was even more interesting, which I attribute to her inviting smile. She is quite an easy person to work with. She say’s she is multi-talented and would love to be here with us any other time… Well, our doors are open to creativity, @me_dapper we will definitely welcome you back. 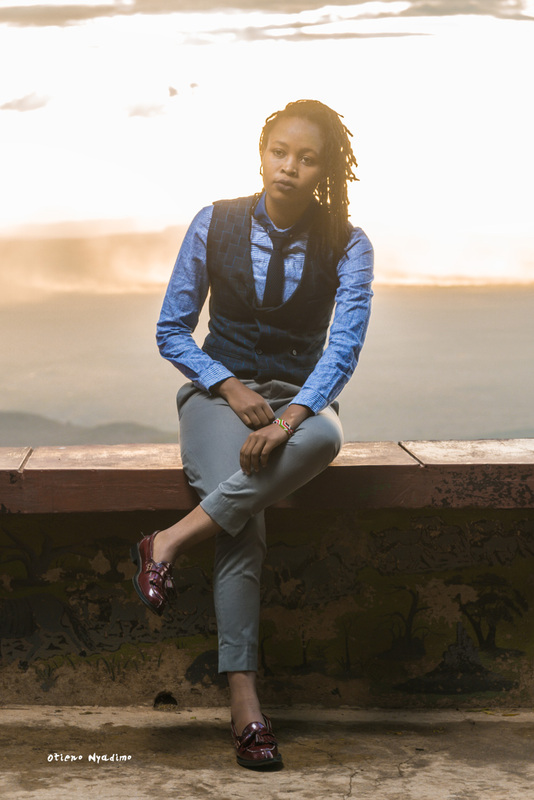 Meet @me_dapper on that Tomboy lifestyle. I am a very determined and highly motivated person. I am quite able to see things in a perspective and believe I am quite easy to work with. Above that, I am a realist and an optimist who can cope well when the going gets tough; I relish in challenge. Professionally I’m a GRAPHIC DESIGNER. I have different looks, one day I can be all girly and the next day I am that new tomboy in the hood….when it comes to color I like black and grey as they go well with anything. I am a sucker when it comes to makeup but can’t leave the house without adding some color on my lips and a dark eyeliner on my eyes; I’m kinda Gothic…I love suits for work and short dresses/shorts with stilettos on night outs. Almost forgot to talk about my love of vans and converse, they always sharpen my look when wearing shorts, skinny jeans and buggy tee…. I always pull it out perfectly… I believe that’s what makes me, me. WHAT DO YOUR FRIENDS AND FAMILY THINK ABOUT YOUR STYLE? Leather/Denim jacket, boots, loafers, vans and converse….they go well with almost anything that I put on. IF YOU WERE TO GIVE ADVICE ON PERSONAL IMAGE,WHAT WOULD YOU TELL THE WORLD? WHAT DO YOU THINK ABOUT SHE’S A TOMBOY? She’s A Tomboy is a platform that is giving us a chance to express our style comfortably without the fear of being judged. I love the concept of free experetion through what one wears…Your personalities are cool too . Now that is my girl! Shiro you rock!!! Much respect…I love the business casual look and try often to achieve this same look. I appreciate the versatile look because it shows self expression to be different. Always look forward to different and new styles. Love the free and natural you. Your outfits stands unique …good job Shiro …. This is good. Keep up the good work Ciiru! AMEN!!! I have finally found someone i can relate to in terms of style. Cheers to WE Tomboys!!!!!!! Thank you Rheen. Cheers :)…. Can you dress me for a day? ?